Art Pac Kit was commissioned by Arts Brookfield and curated by Amy Lipton of ecoartspace, for TRANSported, a project for the New Museum’s Ideas City. Art Pac Kit was housed within and utilized the unique features of a twenty-foot shipping container as a vehicle for dialogue and conversation. The project was presented as a shanty-like center for art and sustainability practices set against the towering backdrop of glass and polished stone in lower Manhattan. My project involved propagating basil seeds in a makeshift greenhouse. The seedlings where then transplanted into the empty, disposable coffee cups of passers by. Hundreds of seedlings were given away and hundreds of conversations were had about topics ranging from terrace gardening to renegade urban farming. Seeds were provided by the Hudson Valley Seed Library. A second project, also supported by the Hudson Valley Seed Library, encouraged those exploring Art Pac Kit to create their own seed bomb. 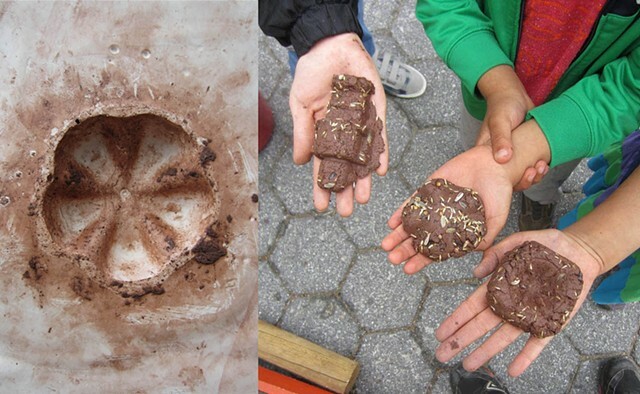 A mix of soil, compost, seeds and water were pressed into simple molds that were created by students and faculty from SUNY New Paltz. Seed bomb makers were encouraged to plant or toss their seedy sculptures into places where they wanted to see more greenery abound.